I've had this post on my mind for quite some time but always felt like I never had time to write. Funny how you have a ton of time when your eyes aren't glued to a screen (i.e. phone, TV, etc.). I started a 21 day social media (mostly Facebook) fast. Our church challenged all of us to fast something for 21 days and fill that time we normally spend doing said thing with leaning in closer to the Lord. I am going to do just that and more. My screen time minutes came up today as they do every Sunday and for the first time I looked at the average amount spent on my phone scrolling through Facebook or Insta, playing games (deleted those too), adding items to my baby registry (that's allowed though right? ), etc. and the average time was staggering. I don't feel the need to divulge that information here as it is quite embarrassing actually. But I looked at those numbers and thought, "Wow! I can do so much with that time each day...doing things that are vastly more important!" So I deleted the Facebook app (for now) and deleted the games I was playing and am really looking forward to leaning into the Lord in the next 3 weeks and seeing what He has in store. All that said, that's not the point of this blog. I just went on a tangent to say that I now have time to blog since my time isn't taken up with other things. You know by now if you read this blog or follow me on social media that we are pregnant with our rainbow baby. Naming children has always been a big deal to us. We looked carefully at the meaning of our son's name before attaching it to him. Gabriel means "God is my strength" and Kayden means "fighter." We wanted him to always draw his strength from the Lord and fight for what's right. Our prayer is that we can continue to raise him up in that way. We've always been fond of Hebrew names so when we became pregnant with our second and knew we were having a girl, we knew Zivah would be her first name. It means "radiant" or "light of God." It was tougher to choose a middle name we both liked this time but we chose Noelle which means "Christmas." She was conceived during the Christmas season and was our great gift last year when we found out we were pregnant only 4 days after Christmas. Her light, however, was too bright for this world and God called her home before we got a chance to make memories with her. We knew when we got pregnant again that this child's name had to have a super special meaning since he/she was our rainbow baby. Many of you know we are having a girl and her name is Grace Reign. What most of you don't know is the origin behind her name. Grace was never on my radar as a first name. I liked it for a middle name but I just never thought I would name her Grace. That is until my husband had a very special dream 2 days after we found out I was pregnant. In his dream someone (we are assuming the Lord's voice) told him to go get Kayla and Grace. He agreed but asked, "Who is Grace?" The voice replied, "It's what Zivah is calling her." We knew then that if we were having a girl, that would be her name. And let me tell you, the word Grace has shown up often in our lives in various places since then. The middle name was trickier and we immediately started brainstorming a middle name that would go with Grace (before we even knew it was a girl). We announced our pregnancy six weeks in and the day after our announcement is when her middle name was also revealed to us. A sweet friend approached us at church the following day and told us that the Lord kept giving her the name Rain. Immediately my defenses went up. "I am not naming my child after a form of precipitation." No offense to anyone with the name Rain...it just wasn't for me. But then she continued. Rain is part of RAINbow and you need rain for things to grow but there's the other type of rain...Reign. As in He REIGNS. And I fell in love. When I said the name out loud, Grace Reign, we both knew instantly that it would be her name...before we were even certain it was a girl. We stopped searching for middle names after that. And in November, we found out we were having another girl, Zivah's little sister, whom she named. I can't wait to tell our girl the story of her name and how special it is to us...how special she is. She is our rainbow after the storm. We all are waiting anxiously for May to get here so we can meet our Baby Grace, as Gabe calls her. She is already so incredibly loved. Thank you to those that walked through our grief with us in 2018. We can't wait to walk through the triumph in 2019 with you as well. Today has been productive. It's only the 5th of January and our word for the year is in full swing. Hubby and I started a few years ago choosing a word for our family. Sometimes my personal word is the same. Sometimes it is different. Last year, our family word was ADVENTURE. And we definitely had a 2018 of adventure...not the adventure we were anticipating but it was certainly uncharted territory for the both of us. Grief is like that. Navigating the rough waters of that grief was an adventure to say the least. This year, together, we have chosen the word SIMPLIFY. This holiday season we looked around at all the stuff and decided it was time to let it go (cue Frozen music here). We have been slowly doing just that over the last week and a half. Three loads have been taken to Salvation Army, several bags of garbage have been thrown out, and there is even a lovely pile by the street as a I write. Today we put away the last of our Christmas stuff (sans outside lights), our beloved village. As we reorganized and revamped the storage in the garage, we also went through a few things and threw them out. I've chosen a few things here and there to go through each day and it makes it much more attainable. We've rearranged certain spaces to simplify the look and make it more usable. It feels so wonderful to get rid of the excess. We aren't just choosing this word in our house, but we want to choose it in our lives as well. Simplicity is so attractive to me right now. 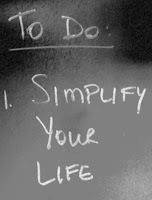 I don't want the complications of busy schedules or huge to do lists or laundry lists of wants. I just want to live simply and happily. We didn't make lists of goals to accomplish this year. Our word is our goal, whatever that may look like throughout the year. I do realize that we must be mindful not to confuse simplicity with complacency or comfort because that is certainly not what the Lord has called us to. He has called us to live boldly and with abandon for Him. I believe when we simplify our lives in the ways we have discussed, it will free us up to live in the way the Lord calls us. Initially, I wasn't sure I wanted my own word this year. But I actually took a little quiz on dayspring.com about "Your Word of the Year." At first I was just doing it for fun but then it gave me my word and I loved it. I felt a sweet desire to do just that. My word this year for myself is DELIGHT. I want to delight in the Lord and all He is and has to offer our family this year. I want to delight in my family and our time together. I want to delight in my children. Adding a new addition in May is going to be delightful for sure and I cannot wait to hold my sweet Grace Reign and breathe her in and love the stuffing out of her. I want to delight in the simple things of life and not get so wrapped up in things I cannot change. I'm done wasting precious energy letting simple frustrations rob my joy. I want to delight in life itself and delight in the simple peace that comes from knowing my Savior. Today has been a no screen day for our munchkin and a limited screen day for me. We put away the Christmas village, I caught up on laundry, did the dishes, finished all the reading and assessments for my online class, read a few chapters in my new book, spent time in bible study, started pot roast in the instant pot, and am now writing - something I need to do regularly and haven't been. The hubby has been next door helping build a shed while the little man has been over there playing outside with his cousins. I can hear the laughter and delighted squeals over the fence and it makes my momma heart happy. We want him to enjoy the idea of simplicity too. We've come up with a system for our family responsibilities each week that now will coincide with his earned screen time minutes. I am so looking forward to using this starting tomorrow. Perhaps I'll share more about that in another blog after we've had a few weeks under our belts. Thanks for reading. I'd love to know what your word is and why you chose it so leave a comment and let me know.